LOCUST PROJECTS is pleased to announce Fancy Meetings, an exhibition by New York-based, Lithuanian born artist Aidias Bareikis in the main exhibition space. 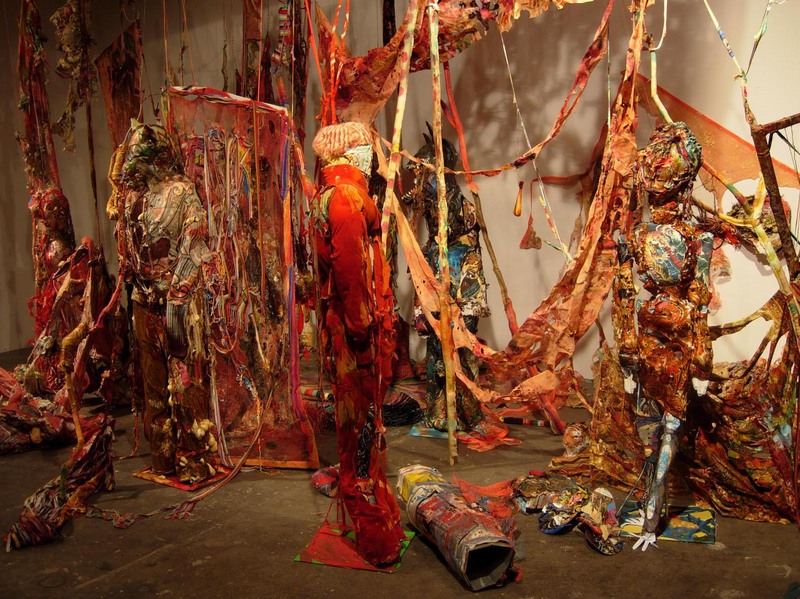 Fancy Meetings, a sprawling grotesque installation of found objects, is Bareikis’ first exhibition in Florida. In the LP Project Room, London-based artist Doug Fishbone brings us Towards A Common Understanding, a video installation of mass media images and clichés that through their excess become absurd. Locust Projects will host an opening reception, sponsored in part by Peroni, Italy, on Saturday, March 10, 2007 from 7-11pm. Both exhibitions will be on view to the public during regular Locust hours, Thursday- Saturday 12-5pm, and end April 7, 2007. Born in Vilnius, Lithuania, and currently-based in New York, Bareikis has gained some notoriety for his extensive and abject installations, which often riff on art historical classics like Rodin’s The Burghers of Calais or Matthias Grunewals’ Isenhein Alterpiece. Made exclusively from things found in the street or discovered in thrift stores and flea markets, Bareikis creates toxic wasteland constructions that reek of the post-apocalyptic. The work alludes to the grotesque scenery of our nuclear anxiety but is reformatted for the age of transnational terrorism and seemingly unprecedented environmental disaster. Like a modern day alchemist, Bareikis puts all the junk he gathers through transformative operations. He alters it by adding chemicals, exposing it to the elements, or just cooking it on a grill. Objects are left with their top-most layers coming off, crinkling, or partially melted, like the skin of the victims of some Chernobyl spill or chemical weapons slip-up. Decomposition and mutation take center stage. And the unpalatable coloration that often accompanies his work comes from incorporated organic foodstuffs, like soy sauces and coffee. Often employing bbq’d clown facemasks, tinfoil vehicles and broken furniture, these engulfing installations carry an air of the ruined landscapes, of the exposed interiors—human and architectural—that follows the catastrophic. They turn the discards of our post-industrial society into an orchestrated chaos, the paranoia of post 9/11 America into possibly build-ups that always threaten to, at least metaphorically, take over everything. But like all things that conjoin horror and hysteria, these sculptural monstrosities often edge the hilarious, enacting a kind of involuntary gallows’ humor. Detritus and decay and the ubiquitous flea market trinket may be the main ingredients, but they coalesce into tweaked and intense theatrical presentations.